There are so many things to look forward to in autumn. The colours of the world change from bright colours to more melancholy tones. The weather cools down and we put away summer clothes. The flowers die away, the rain starts falling and the leaves go brown and red and orange. And on top of all that, it is the time for fall customizations! Now that is most definitely something to look forward to! All those items you've put away in your safety deposit box through the long unending seasons of winter, spring and summer can now be dusted off and placed in your closet! To celebrate the wonderful time that is the fall season, we are going to illustrate the best of autumn customizations with two NC outfits. Now why aren't we doing one NP and one NC outfit, you may ask? And it would be a good question. There are lamentably few autumn themed NP items. In fact, there is only one background. There is only one set of wings. There is only one foreground. And as it happens, there aren't all that many autumn themed NC items either! The amount of autumn themed items does not come near the sheer variety of winter themed items, that's for sure! It seems to us that TNT rather neglects autumn items and instead showers us with Halloween items! Not that Halloween items are not spectacular, but in 2012 there were two Halloween themed NC events: Edolie's Phantastic finds and Masks of Dread. Both contained only spooky items! Here's hoping that in future, fall will get the attention it deserves. However, the fall items that do exist are fantastic and we will start off showing you why that is in the customization of a female red Draik! To begin with, there is this absolutely gorgeous little number, which is a great representation of autumn! 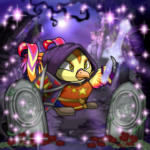 It has all the seasonal colours, and fits beautifully on Draiks and many other pets. This is also the most recent item of the customisation and currently in the fall shop of the NC mall. Get it quick before it retires, fashion waits for no pet! The background is the core of any customisation, and this one makes a very cute core! One of the most popular NC backgrounds, it represents the perfect autumn day. Orange leaves falling, sunny day... It's perfectly lovely. And to top it off, it isn't too crowded and can be coupled with many foregrounds, garlands and background items without anything standing out strangely! An autumn customisation must have. Now this trinket is a hard one. Oh it is pretty, absolutely dashing you might say. But it comes up in an odd place in customisations. It's hard to couple with backgrounds which have too many elements at the bottom. However, it is a perfect fit for our chosen background, so enjoy the effect! Arguably the most perfect autumn wig available to neopia. It is elegant. It is subtle. It is perfectly designed in shape and colour. One of the biggest hits of autumn 2012, it had female neopets fighting each other to get their hands on this height of capillary perfection. Now we all know that autumn can be a chilly season, and TNT has kindly made an item to keep our female pets warm, in style! This item could have come out wonderful or terrible: a leaf as a garment, that can't be right! But, designer genius hits again, and we could not go through the autumn season without using this caplet to warm our girls in this potentially breezy weather. Living without these contacts is a tragedy. There are two types of contacts in neopia: contacts which change the shape of the pupil and contacts that do not. These contacts are part of that second group. We have a slight preference for these because in some cases changing the shape of the pupil will make your pet's eyes look huge, which can look pretty strange. Furthermore, the lovely turquoise shade of these particular contacts is a highly desirable eye colour! Wings are controversial items on the NC mall boards. The concept is wonderful, as wings are a symbol of freedom, which every pet wants. But in practice they are hard to fit into a customisation, so they are used less than they deserve. One of the problems with wings is their animation. The wings we have chosen are stationary, but change colours to represent all those you associate with fall. This makes them fairly easy to use, and means that they will match any other items you combine them with, no matter what the colour. Unfortunately, there are few NC shoes in the right colours for autumn. But, these ones are lovely enough to compensate for the lack of choice! One of the two items of this customisation which are not technically autumn items, they are nonetheless a great choice for any fall customisation. Foregrounds are great to spruce up a boring customisation. This one is a very cute autumn themed one. Perhaps not the prettiest or most common one you can see, but if you want to be original in your customisation, this might just be the right one to go for. Last but not least the bouquet. One of our 5 favourite autumn items, it's the greatest handheld for female pets. Bouquets and flowers are generally a great choice of a right hand item for two legged pets. As these pets always have their left hand out, it looks awkward not to put anything in it. And holding a flower is a natural thing to do, which makes the task of making the customisation realistic much easier! And next up we have our wonderful male red Draik autumn customization! To start off with our male customization, we have a lovely autumn background. Full of warm and dark tones, this blends perfectly with any other autumn themed items! Arguably our favourite of the autumn backgrounds, this perfectly captures the feeling of the days growing colder and shorter, making you want to curl up and cozy indoors! This beautiful garland gives the customization the great illusion of a tree branch hanging overhead, with its leaves changing to deep oranges and reds. This garland is also animated, with the leaves slowly and gently falling to the ground. If you love seeing the trees change to fall colours, then you'll love this addition to your closet! Of the autumn wings we have to choose from, this is one of the easier ones to customize with! These animated autumn wings, made of the multicoloured leaves of the season, also float gracefully to the ground, along with the garland. They also perfectly replace the Draik's regular wings, allowing your pet to seamlessly become more fall themed, despite only being a basic colour! A great jacket is essential to any closet, especially to combat the colder days of fall. Bundle up your pet with this fitted off-orange/brown coat that's sure to keep them warm! Keep this item in your closet and pull it out to use in the winter as well. If you don't like jackets, using a sweater in your customization will work great as well! A perfect fit with the Autumn Wool Coat, these patchwork pants will also keep your pet's legs nice and toasty! If you don't like the brown tones of this outfit, try finding something red or orange to go with the rest of the autumn theme. Or if pants aren't your thing, try finding a large cloak instead! As stated with the female customization, there aren't many boots or shoes that are autumn coloured. Our best suggestion is to find something black or brown. The Rugged Work Boots were the best fit for our customization, and they're still available in the NC Mall! Although the red Draik has red eyes that go well with autumn, we felt they stood out a bit too much with the rest of the customization, so we found a pair of contacts to use! The Krawley Contacts are a nice dull orange, which still blends with the fall theme, but don't stand out as much as the natural red eyes. Contacts are an easy way to blend your pet in more with your customization while still keeping things simple! Adding into the background, this foreground gives the illusion of the autumn leaves piling up from the trees. It goes especially well with the falling leaves of our garland! There are also few autumn themed foregrounds to choose from, but thankfully they are all pretty fantastic choices for a fall customization! This is certainly the best of all of them! Now, this may seem like an odd choice for an autumn outfit, but the colours of the hat are just too perfect to pass up! You may miss this item while looking for stuff for a fall customization, but don't forget that clothing you use doesn't necessarily have to be autumn themed itself! Be sure to look into other non-season items. Many of them match the autumn colours and will go well in your fall closet! Hand accessories don't have to be big! The Father Times Watch is a perfect example of how a small handheld item can work great instead of large bulky staffs or wands. Whereas a staff can be giant and take away the focus of your outfit, a smaller accessory can still add to the customization without taking away from the rest of it! Fall is an absolutely wonderful time of year! Beautiful colours emerge and inspire fantastic customizations! Although fall themed items in general appear to be limited, there are still many items and clothes you can use in your fall closet! So despite the lack of actual autumn items to choose from, try out some old clothes you might not ever think to use. You'd be surprised what goes well in your autumn outfit!